This is the place where you cast your line into the weed beds, chase a grand slam and hook a 30-pound pike. It’s where you fight the line for hours a day, and go home with stories they won’t believe. Cobham River Lodge is isolated in Manitoba’s Canadian wilderness where you and your group have an unmatched fishing opportunity to fish where no other fisherman has fished before. The result, the fishing trip of a lifetime with pictures to prove it! From American Plan Packages to Deluxe Fly-In Outpost Packages, we can accommodate any groups needs. Join the waiting list for 2020! Can’t make it happen in 2019, join our waiting list and get the date and trophy you’re after in 2020. When you compare other fly-in lodges you’ll be hard pressed to hear them mention a waiting list or that they are sold out. The reason is simple, we have the best trophy Northern Pike fishing in Manitoba. While other flyin lodges have up to 18 boats firing off the dock each morning, we limit our 76,000 acres to 5 or 6 boats. 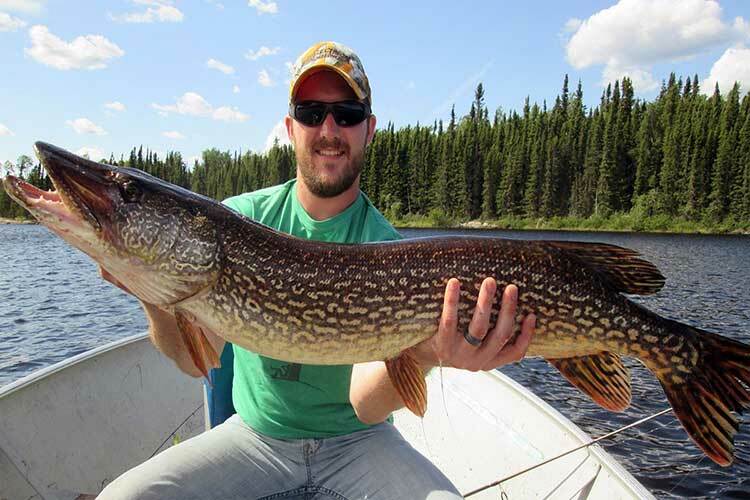 The result is the best Northern Pike fishing in Manitoba, but only for the select few. After 40 years in business this has resulted in “Sold out” and “Join our waiting list” being common place. Get on the list and be one of the boats going out in 2020. We’d love to meet you and your group. Boasting an expansive Canadian shoreline, we’ve made our name in pike fishing, attracting anglers the around the globe. Add the numerous weed beds, creeks, and hundreds of miles of shoreline Cobham River Lodge is the ultimate Canadian fishing lodge for world class Northern Pike fishing. Cobham River was built around conservation, our fishing program is proud to have released all trophy fish for over 35 years. The result, 45 to 50+ inch Northern Pike being released every season. Roughly only 140 people get the chance to fish our Canadian waters each year. Are you one of them? 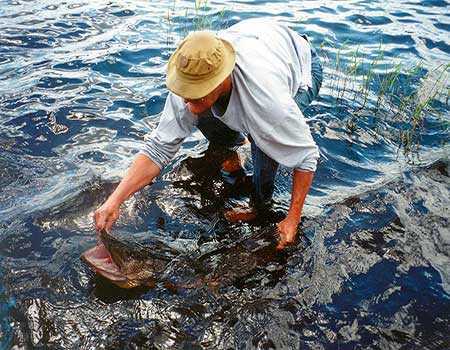 Why book a Canadian Fly in fishing trip? You can’t stay in business for over 40 years flying guests to a water system with no fish. Our Lodge is located on 2 river systems that provide the best opportunity for huge Northern Pike to feed off an endless supply of Walleye, Perch, and Whitefish. Our system has 76,000 acres of fishing area with hundreds of bays, hundreds of miles of shoreline that all act as a one-of-a-kind habitat. With a system like ours we don’t call it “Fishing” we call it “Catching.” It is not uncommon for 2 fishermen to catch and release over 100 fish per day. We often say you will catch or at least see the biggest pike of your life on the first day. View our Guide Maps for detail fishing locations. Or learn more about what makes Monster Northern Pike and where they live. The result is people have an outstanding trip and return for many years to come. 90% of our bookings are returning guests and referrals. Our staff takes pride in thinking of what you need before you ask for it. Meals are prepared with the same thought. We have new equipment that makes it easy to concentrate on what you came to do, fish. We want you to not only brag about the fishing but also our lodge and staff. One of my brightest childhood memories was when my dad took me to Canada fishing. So, let’s create new memories for your family by offering a 50% child discount. One child under 18 receives a 50% discount when accompanied by one full paying adult. What a better way than spending the day fishing without any modern-day distractions (IE. mobile device). Call us today and start making your own childhood memories. Whether you’re trying to break our 41 lb. 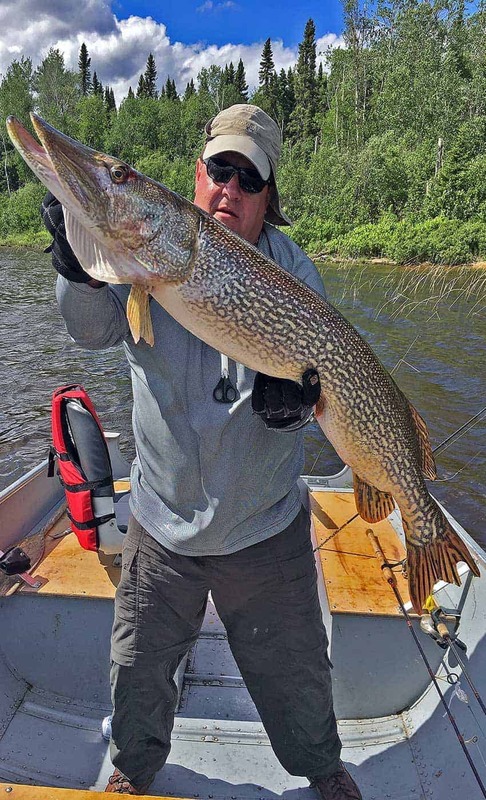 Northern Pike record, or catch your daily walleye for shore lunch – Cobham River’s abundant calm waters, scenic shoreline, outstanding staff, and 40 years of experience are sure to make for a memorable fishing vacation! Cobham River you don’t have to spend hours getting to the fish. In fact, a number of the best fishing locations are within sight of the Lodge. In 2018 we had a 48″ pike caught within 300 yards of our dock. 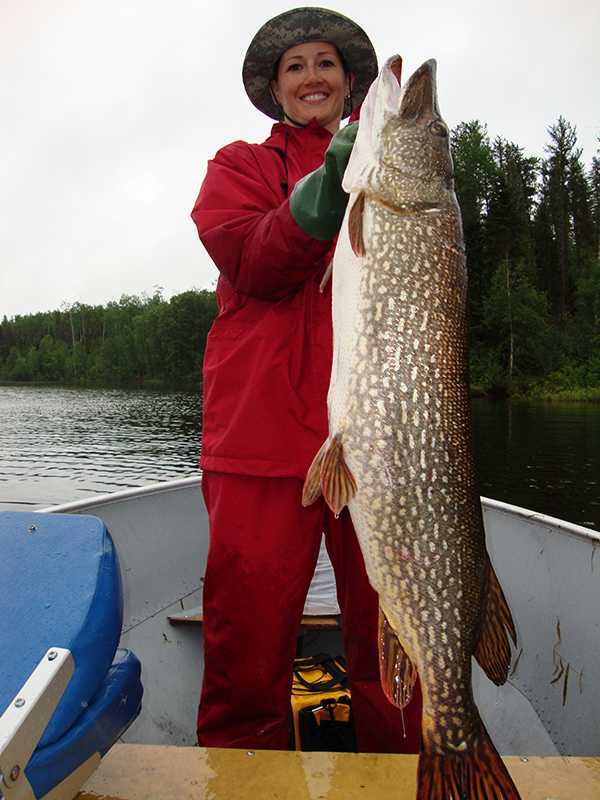 Our Northern Pike are aggressive and anglers have landed thousands of giant Northern Pike in the 38″- 50″ range. The Cobham River Northern Pike record currently stands at 53.54 inches (41 lbs).